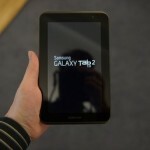 Home Articles Product Reviews Samsung Galaxy Tab 2 – How it differs from tab 1? Samsung Galaxy Tab 2 – How it differs from tab 1? The tab market seems to be blooming and blooming! With mobile manufacturers bridging the gap between mobiles and laptops/net books, the tab market just gets bigger and bigger. Reports by Gartner suggest that globally the tab sales will cross 110 Mn this year and India too will get its fair share of the sales. One such manufacturer that will look to dominate in this segment, Samsung has just launched its second version of the Galaxy Series of tablets. 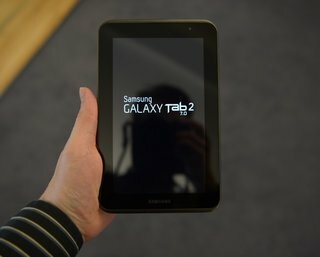 Being a 7 inch tab, the Samsung Galaxy Tab 2 has hit the right spot as consumers now look forward to the 7 inch tabs rather than the 10 inch ones seeking the comfort and usability factor. The 7 inch tabs houses LCD Capacitative screen with a 1024 X 600 resolution with the best in class graphics. The tab features a 1GHz Dual-Core Processor for that swift usage. And along with this, you’d 1 GB RAM and a cool 16GB internal memory. If that disappoints a bit, Samsung gives you an option to use a Micro SD (expandable to 32GB). Touching up a bit more on the hardware – The tab gives you a decent battery life – one that gives you about a 4 hours on a continuous wi-fi usage including surfing, streaming, playing games. But with normal usage- a full batter charge should last about a full day- thanks to a 4000 Mhz Battery. With the battery the tab weighs about 345 grams – which again is pretty light considering the size! Well tabs aren’t known for great cameras, so does this one, giving you only a 3MP primary camera and a front camera for your video chatting (oh yes- this tabs supports 3G connectivity as well). With the primary camera you can expect only about 720p worth of video recording quality. Also, the tab can house a GSM SIM card as well! So overall, from a hardware front, the build is pretty solid with bare necessary hardware specs that a tab requires. Thanks to the OS- the Android Ice Cream Sandwich the tab many of you would want to grab this one! With lacs of apps in Google Play (erstwhile Android Market) you’d just love the tab! All this for just above Rs. 19,000! So when are you getting yourself one! Next article[Marketing Concepts] What is Permission Marketing?